Starting business operations in an unfamiliar territory can be a daunting task. Meeting the needs of expatriate employees arriving in the country for the first time is a demanding undertaking. Al Burhan is well positioned to offer an extensive variety of local services enabling new visitors to have smooth transitions. 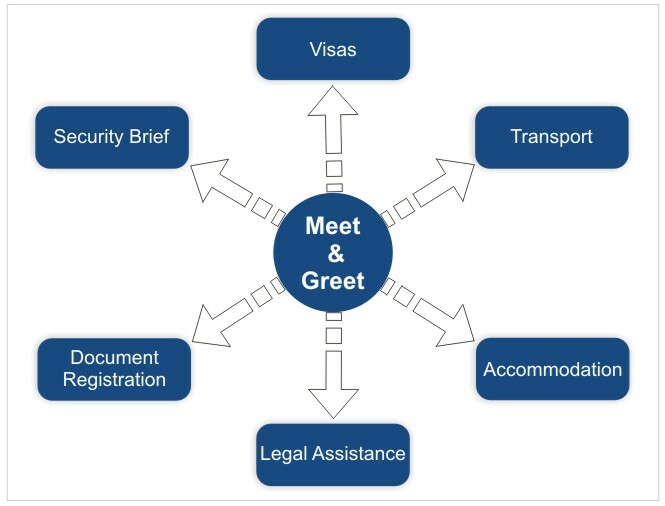 Al-Burhan Group as part of its Iraq Travel & Local Services offers a ‘meet & greet’ package to administer the various requirements of foreign companies and nationals entering Iraq. This service centres on meeting the requirements of employees arriving in Iraq for the first time. From assistance with immigration and local authorities to organising accommodation and logistics; we can provide a custom package of assistance allowing you to focus on your business. Provision of airport meet and greet service for all new arrivals at BIAP. Meeting employees at airport; assisting with immigration and baggage processing. Assistance with airport and/or airline authorities in case of lost baggage/other issues. Al-Burhan Group representatives positioned ahead of new arrivals at terminal. Application and guidance with required legal documents. Provision of security brief for new arrivals including latest security situation. New arrivals transported (via bus with a/c) to their accommodation quickly and safely. Registration of documents with relevant bodies to enable foreign companies to apply for entry and exit visas. Provision of hospitality, conference facilities and short-notice meeting organisation. Assistance and continued support with any other local issues dictated by client. Al-Burhan Group can plan, design and build accommodation to international standards suitable for expatriate and local employees to reside safely and securely when working in Iraq. Our Group can undertake all the construction and civil works. Involve client in the civil design of the accommodation. Al-Burhan Group takes great effort to involve the client at every stage of the design and construction in order to make sure that expectations are met. Provide and ensure security of the camp including point of access with 24/7 perimeter patrols. Security is a key issue in Iraq; our Group constructs accommodation camps with security in mind. This includes CCTV systems, alarm systems, constant security patrols including a strong entrance/exit point. Al-Burhan promises to provide accommodation to exemplary standards with each camp room containing its own: bathroom, cooking facilities, internet, satellite TV and a full compliment of furnishings (to western standards). As part of our accommodation provision service; we can undertake to organise transport for operational purposes available 24/7. This will consist of a fleet of modern air-conditioned buses with English-speaking, security driving trained drivers. In addition we can provide SUV’s with guards for the secure and fast transportation of the managerial staff and visiting delegations. This service can either be included as part of the camp’s daily operations or we can schedule a separate transport service to cover the whole of Baghdad and wider region. Al-Burhan Group can assist with every aspect of setting up offices in Iraq. Whether the requirement is for a small support office or large full-scale call centre; we can organised the leasing or purchase of office buildings including the purchase of office equipment, stationery and office sundries. The service is again tailored to the needs of our clients; we have strong team on the ground in Iraq which holds a great depth of experience in executing such service provision. We can liaise with 3rd party vendors for various services that may be required; in addition we can all on a wide array of trusted suppliers to help you execute your contract. From heavy machinery to satellite communications; our experience and knowledge of available services in Iraq is second to none. Ensure assistance in providing adequate amenities at the office, including cleaning to ensure no disruptions to work. One of the most important aspects of doing business in any country is the appropriate and properly executed organisation of banking and finance requirements. Our Financial Department has a long history of experience in assisting with the set up of a banking accounts and documentation. This is particularly useful for a non-registered entity which is to be converted to a registered entity at a later date. We can help ensure that all documentation is ready to ensure timely fund transfers from local banks to your head office. We will always be at hand to assist at the last minute if things go wrong or there are unexpected delays with regards to the moving of funds. In addition we can help in the ordering of bonds and Letters of Credit (L/C) at short notice. We can also help ensure timely payment from clients and assist with debt collection (subject to appropriate documentation and invoicing). Our trained team of finance managers can be called on at any time to help you work through any difficulties you may experience. As a starting point; Al-Burhan Group can set up a Legal Entity in Iraq on your behalf; this naturally includes the registration of companies/organisations and obtaining required licenses. We can also help register documents with relevant bodies to enable foreign companies to conduct business in Iraq. At Al-Burhan Group we can liaise with tax authorities to complete all tax registration formalities, contracts and employment related issues. We can help your business or organisation adapt to and work with local laws without hindering your operations. Iraq has become a very open commercial environment; ready and willing to invite a wide range of international companies; however local laws and statues must be observed to ensure the smooth operation of your financial activities. In terms of auditing and guidance; our team can help arrange initial meeting with commercial lawyers and auditors to help you monitor the progress of your business in Iraq. Our team can also assist with the drawing up of contracts and for the contract. Assist in all legal and accounting requirements as mandated in Iraq and this includes any change in law. Al-Burhan Group can advise on important legal issues related to carrying out business operations in Iraq. Our legal team can assist with: Investment Law: land transfers and rights of local investment commissions and national investment commission, Employment Law, Insurance Law, Taxation, Anti-corruption Legislation and Intellectual property management.